Mastered by Kevin Gray at AcousTech! Impex's line of classic RCA Living Stereo releases includes the inimitable vocal stylings of Harry Belafonte singing the timeless words and music of American blues in truly breath-taking sound. 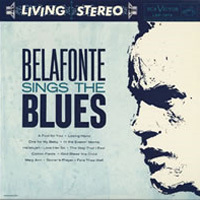 Belafonte Sings the Blues was recorded over 4 sessions during the first half of 1958, and released by RCA later that year. The album features performances of numerous Billie Holiday, Johnny Mercer, and Ray Charles songs performed in a way that only Belafonte can. The blues are close to Belafonte's heart and it shows in the way he delivers such tunes as "One For My Baby", "Cotton Fields" and "God Bless the Child" among others. Impex Records bring you Belafonte's ground-breaking blues set in full fidelity 24K Gold CD, featuring deluxe hardcover packaging with complete lyrics and gorgeous high resolution mastering by Kevin Gray at AcousTech Mastering.